More than 2,000 exhibitors and well over 40,000 visitors descended upon Nuremberg in February this year for the BIOFACH event. The world’s largest trade fair for organic consumer goods brings together the whole industry every year to exchange the latest news and developments in this growing market. It’s official: going organic is increasingly popular, and not just among the event’s trade visitors; German consumers are filling their shopping trollies with ever more organic produce as well. This is also filtering down to the balance sheets of producers and retailers. With this in mind, it is worth noting that since 2004, the proportion of organic produce in spending on food and drink has risen from 1.7% to nearly 4% in 2013. This represents a doubling of market share over the past decade, even if it still remains at a relatively low level. 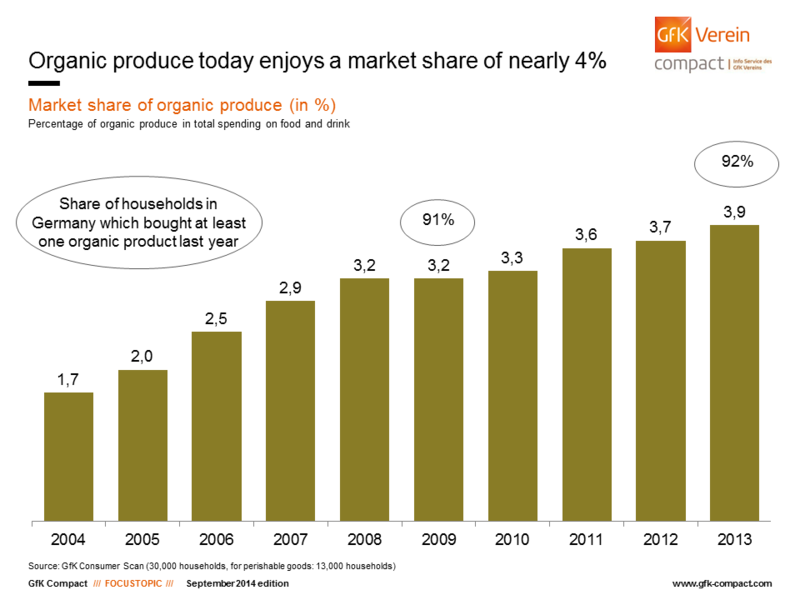 Long-term surveys conducted by GfK Panel Services on purchasing behavior regarding organic produce provided this growth data. 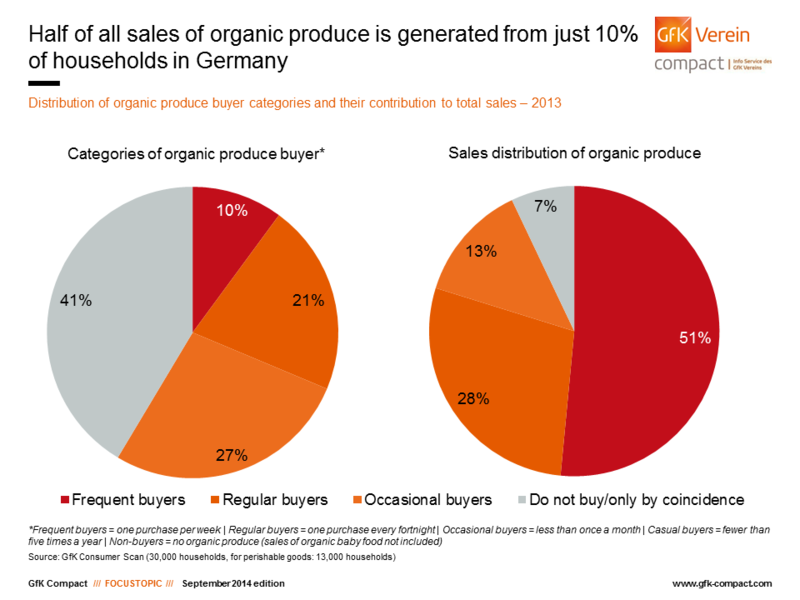 Only very few consumers in Germany live totally “organic free” lifestyles, with the study also bringing to light that more than 90% of households in Germany purchased at least one organic product in the last year. Consumers wanting to buy salad leaves that are free from pesticides, bread rolls without additives and succulent organic meat to grill on the barbeque, no longer have to travel far when out shopping. Organic produce has long since been available on the shelves of regular supermarkets, whereas previously it had been the sole domain of organic food and health stores. Whether it’s Aldi, Lidl, Rewe or Rossmann, the traditional providers of organic produce have long since had to deal with competition from the mainstream. Today, 60% of sales of natural foodstuffs are generated by food retailers including chemists. This market share was barely above 50% just five years previously. Discount stores account for the largest proportion of sales of organic products, with 22% generated by these stores, which puts them head and shoulders above the competition. This increase has mainly been at the expense of other purchasing channels such as traditional bakeries, butchers and (weekly) markets, whose market share has been dwindling for years now. A third of sales originate from organic retail and producers, meaning that this sales channel has re-stabilized after noticeable losses in the years immediately after the millennium. No matter whether it is baked goods, confectionery or drinks, nearly all food groups are now available in their conventional as well as organic format. However, a genuine classic of the organic world has remained at the top of the league for organic food lovers: muesli and cereals are the food group with the highest proportion of organic produce from the entire range. 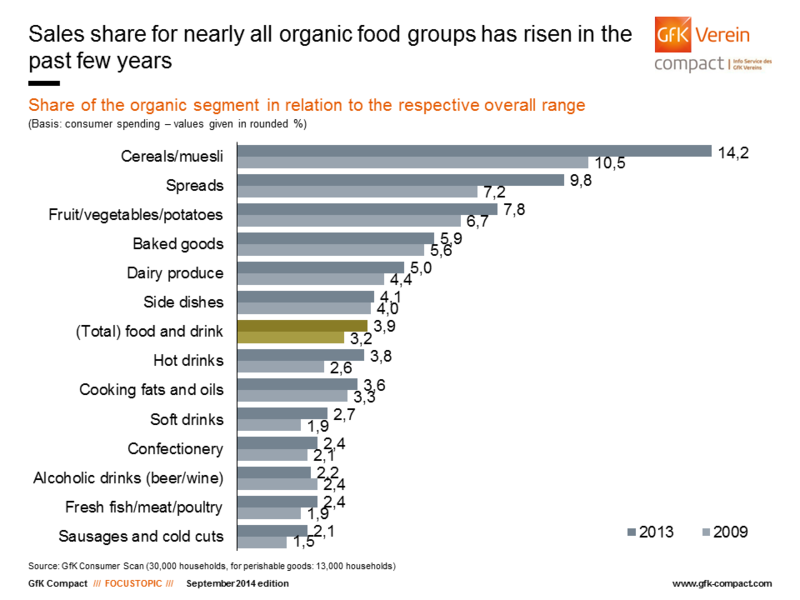 In 2013, 14% of spending on muesli was accounted for by organic products. 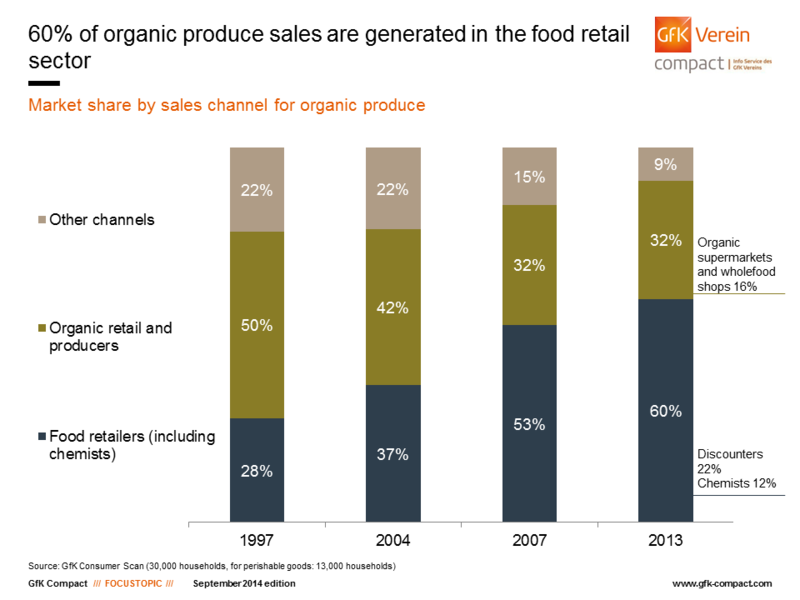 The organic proportion for this food group has risen significantly over the past few years. Sandwich spreads can be found in second place with a share of 10%, followed by fruit, vegetables and potatoes (nearly 8%), baked good (just under 6%) and dairy products (5%). Five years ago, the market share for these front-runners was a few percentage points less than we see today. Yet it is not just with cornflakes, carrots and yoghurt that an upward trend can be identified. Marginal positive developments can be seen in all other food groups, with the exception of one: demand for organic versions of alcoholic drinks was relatively low in 2009 and the proportion of organic wine and beers in refrigerators across Germany has since decreased slightly. This segment has an organic share of just 2.2% and, just as before, ranks alongside fish, meat and poultry, as well as sausages and cold cuts, in bringing up the rear. The first wave of organic fans with their particular nutritional preferences represented a clear and homogenous consumer group: they were, once upon a time, seen as alternative, mostly idealistic, long-haired, quasi-hippy dropouts. Nowadays, “organic” has seemingly shed its once “earthy” image and is also seen as a real opportunity as far as the type of consumers who purchase these products are concerned. At the checkout in organic supermarkets, you are just as likely to see a father on paternal leave as you are to see a boss in her chic office wear, who has quickly dropped by to pick up a healthy snack for lunch. They may well even meet again tomorrow at the chip shop, which points to a shift in consumer behavior; these days, buyers of organic produce do not strictly adhere to one lifestyle or another. They simply buy organic when it suits them, not all the time as a matter of principle. This is confirmed by the purchasing intensity of the various groups of organic consumers. Consumers who buy organic produce at least once a week are defined as frequent buyers. With a share of 10%, it is still comparatively few households in Germany that would fall under this classification. However, this group should not be underestimated as they generate half of all sales in the organic food segment. Regular buyers contribute nearly a quarter of sales (21%), while “occasional buyers”, consumers who purchase organic produce now and then, bring 13% to the table. Yet, casual buyers represent the largest group of consumers. These are consumers who go organic when the mood takes them, ultimately ending up buying organic produce fewer than five times per year. On the face of it, this group would appear to consist of consumers who buy organic produce by mistake, on account of a lack of alternatives or perhaps for a special occasion. 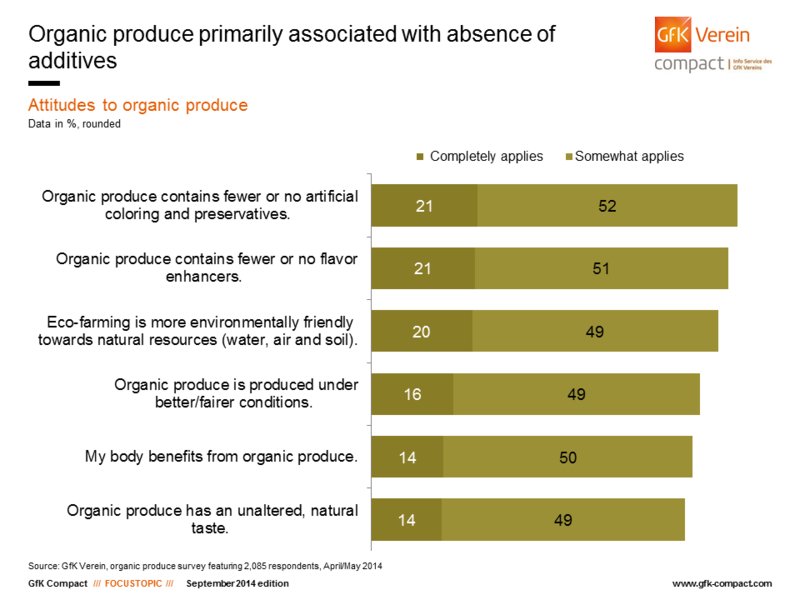 Regardless of motive, these consumers contribute 7% of the total sales of organic produce. Whether or not organic produce is actually more nutritionally beneficial than regular foodstuffs is still the subject of debate among experts. However, Germans clearly believe that they are doing their own bodies good, as their attitudes toward organic produce show. The majority of respondents associated a lack of artificial colorings and preservatives or flavor enhancers with the organic label. A fifth were certain that some ingredients found in conventional produce were not to be found in the organic variants, while 14% held the view that this also results in an improved taste and is good for their health. As well as health benefits, consumers made associations between organic produce, the environment and working conditions in factories; 16% of respondents were confident that organic production results in fairer wages and working conditions. A further fifth of respondents were of the opinion that organic farming is beneficial to the air and soil and makes sparing use of water resources. If you have any queries please contact Helmut Hübsch(helmut.huebsch@gfk.com), Claudia Gaspar (claudia.gaspar@gfk-verein.org) or Claudia Stürmer (claudia.stuermer@gfk-verein.org).